You are here: Home / Ethnic Groups / The People of Sumatra / Who are the Besemah? The Besemah are sometimes called the Pasemah. Pasemah was the name given by a foreigner to this people group due to a difference in pronunciation. Their name is actually Besemah. The center of the Besemah territory is the volcanic peak, Mount Dempo. Besemah communities spread from the volcano’s slopes to the west, south, and southwest along the Bukit Barisan mountain range. The Besemah live in South Sumatra province across parts of the Lahat regency and the entire Pagar Alam municipality. Some Besemah also live in the South Ogan Komering Ulu (OKU) regency and in Bengkulu province in North Kaur district. 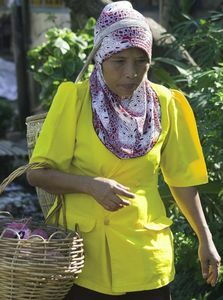 Agriculture is the principle economic activity of the Besemah and is based on three key crops: rice, rubber, and coffee. Planting and harvesting is carried out by groups of five to ten people working in a wage or share cropping system. Besemah houses are built from wood with tin roofs. They usually have three to four rooms including a closed kitchen in the back part of the house. The traditional Besemah house is built on a raised platform 1.5-2.5 meters off the ground. The area under the house is used for various purposes. Some of these include a place to cool down on hot day, or a place to store tools, food and other items. The Besemah recognize three types of marriage: (1) belaki, where the groom pays a bride price, pays for the wedding, and the newlyweds live with the husband’s family; (2) ambil anak, where the husband moves in with the wife’s family and does not need to pay for anything; (3) semendean, where the wedding cost is split, and the newlywed couple are free to choose where to live. These days, many youth follow yet another pattern for marriage: eloping. Most Besemah are Muslim. Islam first entered the Besemah area in the 16th century. The west and northwest areas converted to Islam in the 19th century. At that time, most Basemah followed Sufi Islam. It later spread to all of Sumatra. The teachings of Sufi Islam are focused on feelings and stress the importance of knowing God more than merely observing religious rituals. In the Besemah highlands, there are 26 historical sites including ruins, cemeteries, and domes enclosing statues of Buddha that have been considered sacred places since the 2nd century. There are also large stone statues depicting such scenes as a soldier riding an elephant, a man wrestling with a snake, and a large ocean wave. Besemah people still use these statues as sites for making sacred oaths, and calling upon their ancestors’ spirits for blessing and seeking their protection against natural disasters. One primary need of the Besemah people is for better medical care. They also need help and training to increase crop production through use of appropriate technology for packaging coffee to sell. Coffee has good potential to be developed as an industry for the area.